This is kind of like an engagement ceremony where the bride and groom exchange rings. The groom’s family presents the bride with new clothes. 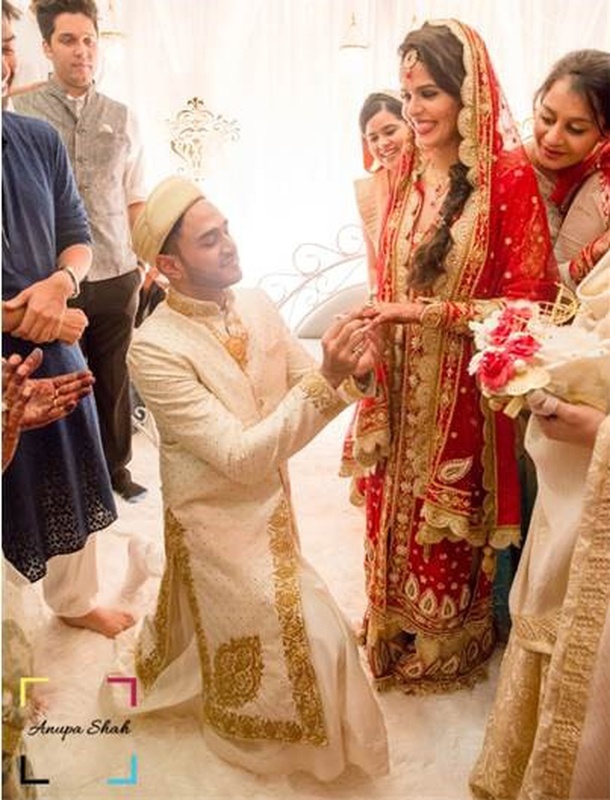 This Muslim wedding ritual is similar to the haldi ceremony. The bride wears yellow and is anointed with turmeric paste that is given by the groom’s family. It is said to bring a natural glow to her skin. After this, a married friend accompanies the bride everywhere until the wedding. It is a celebration with lots of singing and entertainment. This Muslim wedding ceremony is done a day or two before the wedding. It is mainly a ladies function where the bride’s hands and feet are adorned with mehndi/henna. Again, a lot of singing and dancing takes place. After this event, she is expected to not leave her house until the wedding. The groom goes to the wedding venue on a horse or in a car and his family and friends accompany him throughout the way. The lavish procession consists of dhol beats, music and dancing. The groom and his family come with gifts for the bride. On his arrival, the groom and the brother of the bride share a drink of sherbet (juice). This is the main wedding ceremony among Muslims. Sometimes, the bride and groom are made to sit in different rooms or with a curtain drawn between them. The quazi (priest) asks the bride if she agrees to marry the groom. The groom is asked the same. Mehar is money that the groom’s family is supposed to present the bride with at the wedding day. The amount is decided and mehar is offered. Once they agree, they are made to sign a document with a set of terms and conditions. After he proposes and she agrees, the groom is taken to the women’s section where he gifts money to the sisters of the bride. Elders then gift the couple and bless them. Dinner is served separately to men and women. After the lavish first meal, the bride and groom and seated together with a scarf covering their heads and are made to read prayers. The Quran is kept between them and they are only allowed to see each other through mirrors. This is called aarsimashaf. This Muslim wedding ritual refers to when the bride bids farewell to her family. The father of the bride gives her hand to her husband, asking to protect her always. When the bride is to enter the groom’s house, the groom’s mother holds a Quran over her head as she crosses the threshold of the front door. Four days after the wedding, the bride visits her parents’ house. She is greeted with a grand welcome. This Muslim wedding function is the reception after the wedding that is hosted by the groom’s family. It is a cheerful occasion where friends and family are invited to celebrate the bond among two families.